OK, so we had a nice diversion with Bourjois Brun Nylon. 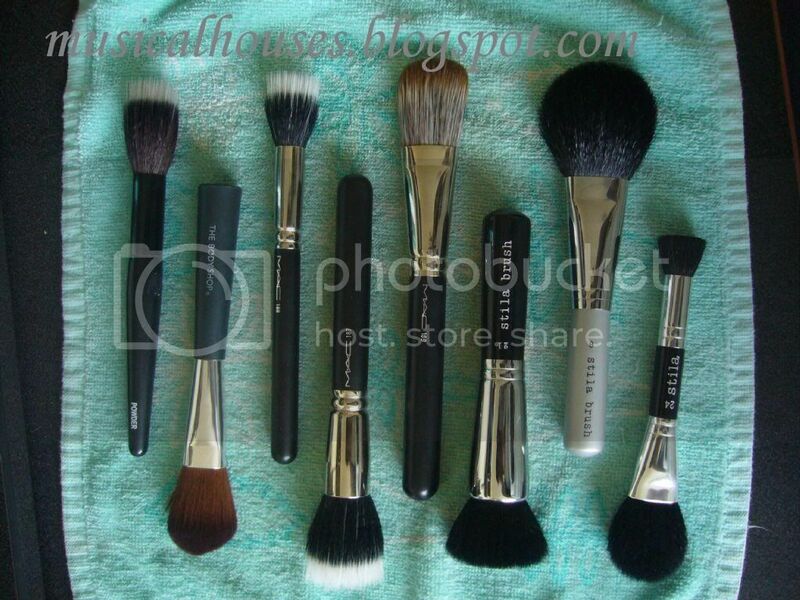 Now back to brushes: here's Part 2 of my face brushes review! So in this previous post, I talked about the MAC 187 and 189, and how they were nice, but not really must-haves for me. Today, I will review and compare The Body Shop's synthetic blush brush, and the Stila #24. Just like how last post's brushes were all for face and foundation, today's brushes are all blush brushes! The Body Shop has a really nice and soft range of synthetic brushes, comparable to the Too Faced ones in feel and quality, and I really like them for the face. I don't like them so much for eyes because sythetic brushes by their nature tend to pick up less pigment than natural hair brushes - this isn't so annoying when applying face powder or blush, when you want a sheerer application, but can be a pain if you're trying to put on eye colour, and you want the colour to show up. Thus, I tend to buy synthetic brushes for face use only. That said, I really like The Body Shop's version, for what it's worth. It has a nice dome shape, which fits into your cheek nicely, and it's nice to hold and use. I use this pretty often, especially for my more pigmented blushes, because like I said, the synthetic bristles pick up less pigment than, say the Stila #24, which is all natural hair. Although of course, if I reallly want a very sheer wash, I'd use my MAC #188 for that, because of its smaller size and it's sparse bristles. The only minor gripe I have with this is that the distribution of powder that it puts on your face isn't totally even. For some reason (I think it's because the dome shape ends abruptly at the sides - does that make sense? I can't think of a better way of putting it), it tends to put a greater amount of color in some areas than in others. It's not a big deal, because I just blend it out and it works well, but it's something I thought I'd just note. Like I said, it's a minor gripe. The MAC 188 is of course, the little sister of the MAC 187, except, much better due to its smaller size. Here, like I mentioned above, it works reallly well for the most pigmented of blushes, like for example, your NARS Exhibit A. It also works fantastically for highlighters, especially for MSFs, because the sparse bristles work to prevent glitter overload. Very useful indeed. I like this one, and there's not much else to be said for this. Last of all, the Stila #24 is a must-have for anyone who loves blush, but has a stash of mostly moderate-to-lightly pigmented blushes. Like the MAC 188, the Stila #24 is made out of natural hair, but the bristles are denser on both ends (duh! ), and the larger end has a dome shape. If you look at the picture above you'll see that the larger domed end is actually just the right shape for blush - meaning that the brush itself isn't big, and the other end (which resembles a mini Stila #21), is really, really tiny. A lot of people ask me if the Stila #24 can be used for the entire face, like for face powder application, because they have been woefully misled by pictures on the Stila website, which somehow always seem to make the Stila #24 look a lot bigger than it is. You defintely won't be able to use this to powder your face, unless you're a pixie or something....Although it COULD double up as a powder blush if you want to squeeze one into your makeup bag, since its bristles are just the right type and density. It just would take a lot longer than using an actual powder brush, such as the Stila #8. Despite its smallness, I really like this brush! I love the rounded, domed end for powder blushes that aren't too pigmented, as it picks up just the right amount, deposits it evenly, and is just the right size for fitting on my cheek! And as for the other mini end? Wellllll....I'm not really sure what to do with it, and to be frankly honest, I rarely, if ever, use that tiny end. I do guess it would probably be good for powder highlighters, for spot highlighting. Otherwise, I can't think of a use for this - suggestions anyone? I do think the tiny end makes this brush a pity, since it is so expensive. I do love the bigger end, but I kind of think for USD$50, it isn't really worth the cost if you're not going to use the smaller end at all. The fact that I have it in my stash shows that I'm a sucker, I guess..